Even the keenest of cooks need a night off from slaving over a hot stove every once in a while, and we all have a favourite takeaway. Whether it’s pizza, Chinese, Indian, Mexican or a simple cheeseburger and chips, as long as it’s just an occasional treat, it’s fine to indulge every now and again. Takeaways are often very generous with their portion sizes, filling the curry container right to the top with sauce and throwing in extra poppadoms or prawn crackers that are inevitably going to break into shards and crumbs before you get your food home. What’s more, your chips are often doused in liberal amounts of vinegar, making all of the wrappings extremely greasy to the touch. 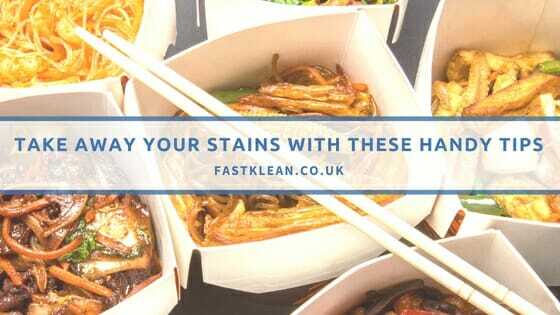 As a result, it can be very easy to get grease or sauce stains on your clothes or soft furnishings on takeaway night, despite your best efforts. Suddenly, ordering in doesn’t seem like it was the best idea after all, as you’re left with extra housework afterwards. However, the domestic experts at Good Housekeeping have recently published a life-saving guide to how to remove all kinds of takeaway-related stains. Phew! From fish and chips to sweet and sour chicken and chicken tikka masala, most takeaways are rather greasy, meaning messy fingers and mouths are inevitable. It can be a challenge to make it from the sofa to the kitchen for a cloth without touching anything, so grease stains on fabrics and soft furnishings can be unavoidable. If you spot a greasy mark, don’t panic – they’re actually really simple to remove. Good Housekeeping explains that all you need to do is apply a little cornflour or talcum powder to the stain, leaving it in place for around five minutes. Then, wipe off the powder with a dry cloth and the stain should have disappeared. If it’s still visible, try applying a little washing-up liquid to the affected area too, before repeating the brushing-off part of the stain removal process. With all of their beautiful fragrant flavours, curries are tasty, aromatic and vibrantly coloured all at the same time. This makes them extremely enjoyable, but the addition of bright spices like turmeric and fresh chillies can make them more likely to leave stains behind too. If you experience a curry sauce spillage, Good Housekeeping advises that you need to act fast, blotting as much of the stain up with paper towels as you can. Then, you’ll need to pour some methylated spirits onto the affected area and leave it alone for at least ten minutes until attempting to blot again. Keep repeating this stage until the majority of the sauce stain is no longer visible, then wash the garment or seat covering on a high temperature. If you’re not brave enough to try this for yourself, remember that FastKlean’s upholstery cleaning service is always on hand to treat your fabrics, using both wet and dry cleaning methods, depending on the type of material and the nature of the stain. Soy sauce is extremely dark in colour, but it’s actually very easy to remove if you act quickly enough. Good Housekeeping explained that soy sauce is “basically a pigment stain”, which means all you need to do is blot any excess and wash the stain away with cold water. Remember not to use hot, as this can encourage the mark to soak in for longer. If your soy sauce stain needs a little extra help, apply a blob of washing-up liquid to the affected spot, before repeating the cold water stage of the process.